I love the holidays! We like to get into the Christmas spirit early at my house. So when I came across the 12 Weeks of Christmas Cookies & Sweets hosted by Meal Planning Magic last week and I realized I could still join in on the fun, I was excited (to say the least)!! I missed the first two weeks, but each Thursday for the next 10 weeks I will be posting my favorite Christmas cookies and other treats. I can hardly wait to try some new recipes and pass them along to you. I am starting with one of my favorite cookie recipes from my Mom. These delicious apple pie cookies melt in your mouth. The soft and flaky cookie is a delightful complement to the tart and spicy apples. And the lemon glaze adds the perfect finishing touch. I love aroma of the apples simmering with the spices and sugar. Definitely one of my favorite fall and winter scents. Be sure to use lots of flour to roll out the dough as it is rather sticky. After filling the circles, simply fold them over and seal them using a fork. Here are the cookies ready to bake. While the cookies taste rather delicious right out of the oven. The icing really finishes off the cookie. Stir together to blend sour cream, egg yolk and vanilla extract. In a separate large bowl stir together flour and sugar. Cut in butter until it resembles coarse crumbs. Mix in sour cream mixture until well blended. Divide dough in half and chill until easy to handle (3 hours or so). In a small saucepan, melt the butter. Add apples, raisins, brown sugar and spices. Cook, stirring occasionally, until apples are fork tender. Remove excess liquid and cool. *Instead of apple pie spice you could substitute 1/2 t cinnamon, 1/4 t ground nutmeg, 1/8 t all spice, and a dash of ground ginger or cloves. **You could use chunky applesauce in place of the apples. Or fruit preserves for the filling. Roll each piece of dough to about 1/8 inch thickness and cut with a 2 1/2 inch round cookie cutter. Fill rounds with a skimpy teaspoon of filling. Fold in half and seal edges with a fork. Place cookies on an ungreased cookie sheet (or parchment paper). Bake at 350°F for 10-15 minutes or until light brown. Remove and cool. Mix ingredients until drizzling consistency. If too thick, add a little more water, if too thin, add more powdered sugar. Drizzle over cooled cookies (I put it in a plastic bag and cut a small hole in the corner to make it easier to drizzle). While I have only tried the apple filling, these cookies would be amazing with any kind of pie filling – pumpkin, peach, berry – You get the idea. They would be a fun addition to your holiday dinners and make lovely gifts for friends and family. What is your favorite holiday cookie or treat? This entry was posted in Cookies, Pie. Bookmark the permalink. These look like little pockets of heaven! Love the presentation, too, in the little bags. What a great gift idea. YUM! Those apple pie cookies look delicious. these are absolutely gorgeous + what a fabulous idea as a gift. i am definitely going to be giving these a try, either for a thanksgiving treat or a christmas one. thanks for sharing! This recipe is definitely a keeper! I love filled cookies, but have never come across any that were apple. Great holiday cookie-so glad you shared this. Yum! These look so tasty! I am going to have to make them soon! I love this idea! These looks beautiful and really tasty. Your crust looks so perfect! I want to try these for sure, and I agree, it would make a great gift. Oh my goodness, these look incredible!! Cookies that are like apple pie? Oh, yum! They look fantastic! Welcome to the 12 Weeks of Christmas! These cookies look wonderful! I can taste them already! What awesome little cookies! My favorite part of a pie is the crust with just a little filling – so these cookies are made for me! What cute cookies! my husband would love these! Oh. My. Goodness! These look so delicious I don’t know that I’d be able to give any away or share them! I love your presentation too and the photographs are terrific. These sound fantastic, BreAna. This is my first time here and I can’t wait to see the rest of u’r site. PS. U’r girls are absolutely adorable. God Bless! How fun, I’ll be sure to check back every Thursday!! These apple pie cookies are calling my name….and I just happen to have apples to use up! excellent recipe collection with really nice presentation..
do stop by mine sometime..
Thankyou thankyou thankyou for this recipe! Just what I was looking for! just looking at that made me want one LOL I think I’ll have to try these for sure! Thanks for visiting me! What gorgeous little cookies! They look wonderful. This gives new meaning to Mom and apple pie. They look scrumptious! These look great! I love anything miniature and these look like little pocket pies – so cute! I’m glad you’ve joined the 12 Weeks and thanks for visiting my blog! Mmm… These sound delicious. My daughter loves pumpkin. I will have to try a batch with apples and a batch with pumpkin for her. I love everything about your blog! These cookies are a genius idea. So much easier to eat than a big piece of pie and they look so yummy. Stopping over from Cast Party Wednesday, that dough looks absolutely amazing. I can imagine it melts in your mouth like you said! I love how these appear to be quite simple but produce such a wonderful looking dessert. Great recipe! Those look absolutely gorgeous! And delicious too. I’ love crust, so they are right up my alley. 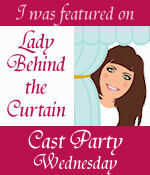 I would love for you to add these to my linky party (Crazy Sweet Tuesday). Have I told you lately how much I LOVE your blog?!?! THIS recipe is reason # 1 million! Can’t wait to make these! Not sure which blog led me to your blog – you know how it goes – but OMG I love the look of your cookies – the idea of your cookie and the thought of smelling your cookies. I have never made a filled cookie. How long do they last after they are made? – I do realize I have to keep hands out of the cookie jar – I love the looks of your blog – I have been a closet lurker of “cookie baking” sites – just bit the bullet and ordered the supplies I will need. In the meantime while I waltz around these amazon boxes trying to get up the courage to open them – I will give your cookies a try. Thank you and Happy Holidays to you and yours. Thank you for your lovely comment! I honestly am not sure how long they keep. I can’t keep myself from eating them within a couple of days. I did freeze a few and they tasted delicious after they thawed. They didn’t look quite as perfect after they were frozen, but they still are yummy! You will have to let me know if you try them! They are definitely one of my favorites!! Good luck with the sugar cookie decorating! I LOVE it!! Ooo these look seriously yummy! !